Q: Who lives and who dies? Q: Why is the Carter family driving through this deserted part of the desert? 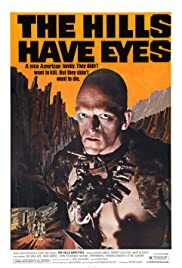 Despite being close to thirty years old, Wes Craven's "The Hills Have Eyes" maintains a distinct raw intensity - far surpassing the level of terror seen in horror films today. The plot in a nutshell; a family on vacation ventures from the main road, ends up stranded in the desert, and falls prey to a malevolent clan of inbred cannibals. Though the story idea may be far from original - it is the atmosphere, directorial style, and acting that raise the overall credibility of the film. The low budget and claustrophobic desert setting creates a sense of dread permeating throughout the entire film; while the grainy look of the print adds a sense of realism to the unfolding events. With a brisk running time of only 89 minutes the film doesn't waste a moment in setting the mood - then when all hell breaks loose it is unrelenting until the final scene. The actors portraying the Carter family bring sufficient emotional range to their characterizations, making it clearly evident that this a normal family being tested beyond the boundaries of civilized nature. It is also worth noting the performances by the actors who play Pluto and Mars (two of the baddies) - these characters are portrayed as both sadistic and devoid of any sympathy. Although the DVD print is grainy (as mentioned above), it is THE definitive version of the film and is thousands of times an improvement over the quality of the video release; quite amazing for a low budget film of this nature. Grim, violent, and symbolic; it is an amazing piece of 70's exploitation horror. "The Hills Have Eyes" is a classic in every sense of the word, and receives an 8/10. 43 of 55 people found this review helpful. Was this review helpful to you?